An atmosphere of cosiness that engenders a warm feeling of contentment and well-being, hygge is a Danish word that became a worldwide phenomenon. 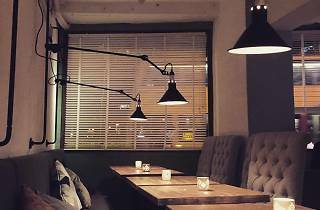 And this bar of the same name brings a little slice of Scandinavian comfort to Tsim Sha Tsui. We enter to a warm welcome from the staff and are seated next to the window before closing the blinds to shut out the bright city lights. 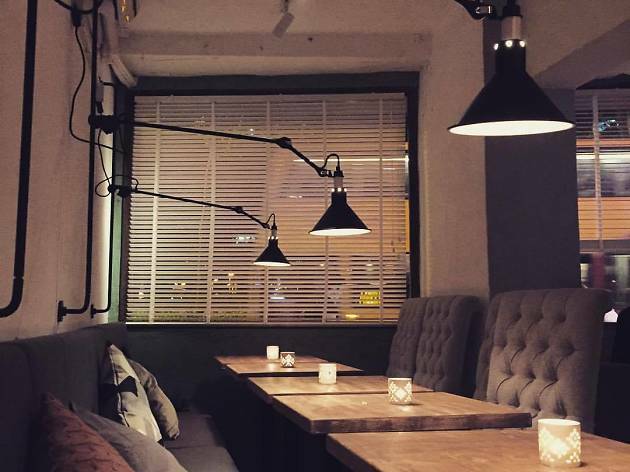 The space is certainly cosy and comforting. The soft, yellow glow from candles plays on the mismatched furniture and there are cute touches like fluffy cardigan cushions. Soulful, jazzy tunes help us slip into a contentment coma as we look over the menu. We order the Rosemary Appletini ($72) made from gin, apple juice, grenadine syrup, ginger ale and lemon juice. It’s pretty sweet but well balanced with a hint of spice and fizz. We’re assured Hygge only uses fresh ingredients and the sliced apple and sprig of rosemary garnish are aromatic and add another dimension to the drink. The Hygge Tonic ($72) is a blend of gin, lavender syrup, orange juice, grapefruit juice and tonic water, garnished with a wedge of grapefruit and a sprig of mint. Much like the Appletini, it’s fresh, but the lavender is undetectable and there’s a little too much lingering bitterness. To munch on, we order the Thai snack basket ($88) which proves to be disappointing. We suspect they’re fresh out of the freezer and into the fryer, served with a very average sweet chilli sauce, obviously not made in-house, and not in keeping with the hygge vibes. A Cozy place and relaxing bar in TST. I love the design amd cheerful staffs. Besides, Thai food are delicious. I definitely will go there a lot.